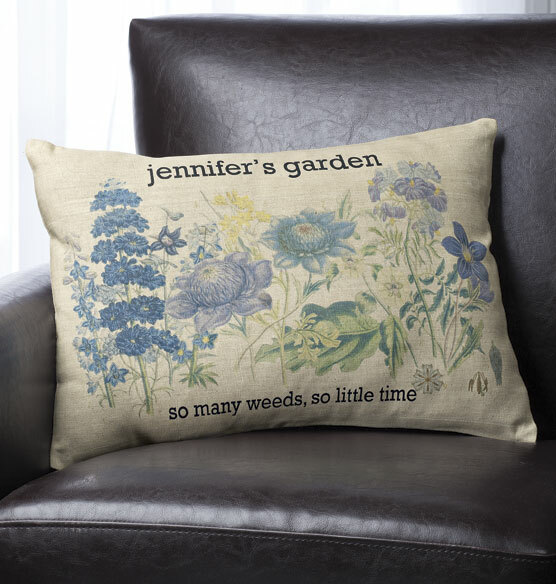 For the avid gardener on your list, this Botanical personalized pillow is a perfect fit. Anyone who has spent time cultivating a flowerbed, or even enthusiastically grown a container garden, will smile at the anti-weeds sentiment it conveys. Personalized with the gardener’s name, this custom throw pillow is a one-of-a-kind tribute to their green thumb. The cotton pillow cover features a colorful botanical design that brings soft floral color to any room. Makes a thoughtful, personal gift idea. Preprinted with a botanical design, the word "garden" and the phrase, "so many weeds, so little time"